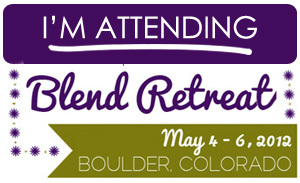 I wish I could afford the Blend Retreat. Maybe next year! I have grilled Tater Tots! Too funny. We did it several times last summer. No way I was turning the oven on! I’m looking forward to going to the retreat. Next year you have to go! In the summer I will find any excuse not to tun on the oven. I am currently involved in a very serious love affair with our grill, too! We have had grilling weather pretty much since the beginning of March, and we have done everything from burgers and chicken to cedar planked salmon and pizza! That gyro looks delicious, you’ve inspired me to give tzatziki sauce another try- I had a bad batch at a restaurant a couple of months ago and have sworn it off ever since! Oh, I can’t wait to grill up some fish, I have never used cedar planks, but I found some at the grocery store and really want to try them out! Your progress has been amazing, I love your updates, keep it up.